What are the different size considerations when selecting phlebotomy chairs? There are several different size options in blood drawing chairs. For larger adult patients bariatric chairs are available that have a wider and longer seat and backrest area as well as additional support throughout the frame. Tall and extra-tall options comfortably seat even the tallest patient and also place the armrest higher off the ground on the frame, allowing the phlebotomist to be able to draw blood without having to stoop over. Standard sized chairs can accommodate most average adults and teens. With a booster cushion for the seat they are also a good option for older children. For very young infants a specialized table style of phlebotomy station is the safest option for the child and the technician. Individuals that are non-ambulatory can be easily accommodated for blood tests using a wheelchair friendly station. This mounts to the wall and slides up and down for positioning based on the chair height and chair arm height. What features in phlebotomy chairs make a technician's work easier? A height adjustment option for the armrest is one feature that can certainly make a day working in the lab or medical facility much less tiring. Most adjustment systems are a simple locking mechanism that allows the armrest to move up and down to the correct height. For complete control over height of the entire chair hydraulic or lift blood drawing chairs provide the most flexibility. These are ideal for busy facilities where multiple phlebotomists may use the same testing station throughout the day. The type of material that phlebotomy chairs are constructed of also can save time in disinfecting the chairs between patients and as needed. Molded plastic, seamless upholstery or a combination of both are good choices. Frames that are metal are likewise easy to care for and very durable. Adding a cabinet or a drawer to the armrest is helpful to store small supplies such as cause, sterilizing pads, tape, bandages and additional syringes. Cabinets tend to be deeper and have a larger capacity than the slimmer drawers. Most of these also provide an additional solid worktop for writing labels and updating notes. 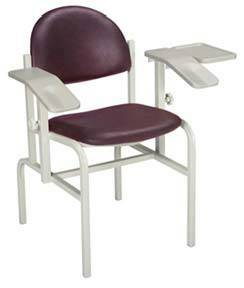 Many models of phlebotomy chairs are designed to allow an IV pole to be quickly and easily attached to the frame. 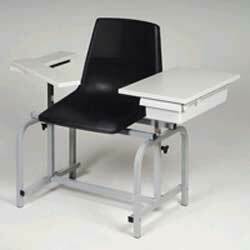 These models may be found in laboratory and medical settings and can extend the use of the chair based on your specific needs. Is a pivot or a flip arm the best option in phlebotomy chairs? Blood drawing chairs can have either a flip arm or a pivot arm. A flip arm moves up and down or flips up and down to allow the patient easy movement in and out of the seat. When the patient is seated the arm is flipped down, providing the solid support needed. A pivot arm rotates out and in based on the same usage pattern. Pivot arms require a bit more room to each side but the difference is minimal on most chairs. As with most medical equipment the different styles offered are largely a personal preference. Often padded or upholstered arms are more likely to pivot while solid surface arms are more commonly designed to flip. There are some models that offer an armrest for the arm that is not being used for the blood draw. This can add to the patient's comfort level and may make getting in and out of the seat easier for patients with mobility problems. The surface area of the armrest needs to be seamless if upholstered and made of a material that will be easy to sterilize using standard cleaning equipment.